Showing results for tags '7 choices'. Here is the first of 3 video recordings from the TruthLoveEnergy Great Gathering. The channeling is pretty choppy because it was the first full-body channeling done in quite some time, but here it is in all of its chubby glory. 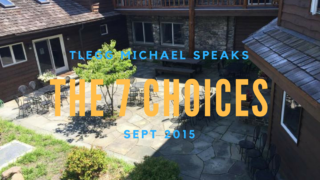 THE 7 CHOICES: Michael describes the 7 Choices that shape and define a lifetime. TRANSCRIPT coming soon via Daniela! TRANSCRIPT COURTESY of Daniela! Thank you!! TLEGG 2016 The 7 Choices 2016-10-01 Channeled through Voice by Troy Tolley OK. We are here now. And hello to each of you. Give us a few moments to strengthen our delivery through Troy. We understand tonight we will talk to you about the topic of the 7 Choices. Troy asked us if there was any definitive choice made in the life that in some ways ended up defining the life. And we said, yes of course and there are 7 of these choices that can be made during the life that tend to help define it. And by define it we mean on your own terms and in terms of how conscious and awake you are as you live the life and how you experience the Review of the life. These choices that we will share with you have already been made by your Essence. They are built into a life in what we’ll call a passive level of choice. They will stay intact as a choice that defines the life but in a passive way. What happens as you grow into your life is that you move toward pivotal moments where you, consciously or sometimes unconsciously, make a more active choice and begin to build upon that particular choice in ways that then become definitive. So as we share with you what these 7 Choices are, keep in mind that they are already intact and that your process, your evolution through your life is when you ACTIVELY build upon those choices. In addition to understanding this PASSIVE/ACTIVE dynamic of these choices is the fact that they are choices that continue to be made. It is not a singular, pivotal choice. They are more like an architectural structure that you build within the life based on the choices that are made that continue to keep those choices active and built upon. So the first choice that you make may not come as a surprise, but that is TO LIVE. Of course you can see how this is built into your life already if you are alive. This choice was made by Essence to live. But there comes a point in your life early or later where you actively chose to live as a Personality. And embrace the life. And to own the life. And to build upon the life. Often this comes in two different ways and this is true for the next 6 choices as well. But each of you tend to choose to live FOR or AGAINST life. And the other dynamic that we can say is a part of this is that you choose to live ENOUGH or to live MORE. These may seem simplistic but they are definitive in your life. When you choose to live FOR something it is a very different life than when you choose to live AGAINST something, AGAINST someone, AGAINST life. When you choose to live ENOUGH it is very different than the life that is lived MORE. Taking on more experiences, seeking out more experiences. This choice is made on a regular basis in some way, in some form, ACTIVELY or PASSIVELY, FOR or AGAINST, ENOUGH or MORE and this tends to define the baseline quality of the life. We can circle back to these for more information as we work our way through. The next choice that you make that helps define the life is TO CARE. Do you care enough or do you try to care more? This is a definitive choice that you make in your life. Do you minimize the necessity to care or do you expand in the challenges of what you care for? This includes yourself, your body, your health, your friends, your loved ones and so forth and you can see if you were to look at this and examine your life as partially defined in how much you care you can see that it is part of the infrastructure of the quality of your life. We would like to add that there is no such thing as caring too much. Often when an individual feels as if he or she cares too much they simply do not have control over the circumstances with which they would like to make better. And it is a process to learn how to navigate this. But it will never serve you in any kind of expansive way to reduce your capacity to care simply because you cannot make the changes immediately or as quickly as you would like. Allow yourselves to care too much, if you choose. The next choice that you make that helps define your life is the choice TO DO. There may be more clever terms that you can come up with for this action in your life but the simple choice to do ENOUGH or to do MORE makes a difference in how the life is defined. Do you do ENOUGH or do you do MORE? The next choice that defines the life is your choice TO TRUST. Each of you trust ENOUGH and it is built into each of you to naturally trust. When you trust ENOUGH, you can sit in a chair without worrying about its legs breaking. This is a base level of trust. You can walk on the ground without fear or worry or distrust in that ground. There are certain elements of life that you inherently trust because Trust is based in experience, as we have described in differentiating Trust from Faith. Trust is based in experience and the more you fulfill the first few choices that define the life, the more capable you are of trusting MORE because you are living more. Doing more. Caring more. And this allows you to trust MORE because your experiences can be counted on, they can be referenced. The next choice that you make is your choice of DEGREE OF INTEGRITY that is fulfilled. This one is a little bit more complex to describe in convenient terms but conveying through Troy we will try to describe that this is the DEGREE OF HONESTY you have about your life. The degree that you’re willing to tell the truth about your life. The degree to which you express the truth and honesty and the degree to which there is a consistency between your inner truths and your outer expression of those truths. Do you tell just ENOUGH of the truth? Are you just honest ENOUGH? Or do you look for deeper truths, broader truths as a means to define the life with integrity? This tends to be where our older soul students are. The first few choices are always still a factor with which you are concerned and doing your dance between ACTIVE and PASSIVE choice-making and building. But when you are an Old Soul you tend to be more and more concerned with how honest you are living your life and this can be painful because many of our students are born into scenarios where they are surrounded by conflicting truths that throw you into turmoil over your own truths and how to express those and to build that integrity into your life and to uphold that in a way that feels beneficial instead of dangerous. This is a struggle. This is part of the gamble of being born and taking the risks as an Old Soul among other soul ages. You will always feel the challenge to the integrity of your truth more than the other soul ages. Do each of you recognize this? This becomes quite a pivotal choice in the life and how you find your way through the life to a point where you feel as if your life is the truth and not that you are the only truth in your life. The next choice is your choice TO SEE. Do you allow yourself to only see ENOUGH? To see to only a certain degree other people? To see only so deep within yourself? Or do you choose to see MORE? Do you allow yourself to see what you do not like to see? Do you allow yourself to see the ugliness alongside the beauty? Do you allow yourself to see the beauty alongside the ugliness? This is yet another difficult dance for the Old Soul. You have seen all the ugliness and you have seen all the beauty. You know the capacity for beauty in a life and it is very difficult for you to sometimes reconcile this. And many of our students tend to lean towards only choosing to see the beauty and ignoring the ugly, ignoring the struggles, the pain, the suffering as much as possible. But it is possible to hold these alongside each other and see them as part of the same importance to existence. What you can do to help with anything that you find ugly or challenging or suffering you will do if you can. You do not have to avoid the ugliness in life in order to have a happy life or to have a peaceful life. If you see an area of life that is ugly to you, whether this is in a personal sense or in a global sense, take a moment to consider what you can DO. And allow yourself to SEE more. This is surprisingly definitive to the meaningfulness of a life in Review. When the Personality actively chooses to see more, this feeds the soul more than you could possibly comprehend while you are Personality, while you are in this more restrictive dimension. And the next choice that you make and one of the most, we will not say most important, but one of the broader choices that you will make is how much you allow yourself TO KNOW. Do you only allow yourself to know ENOUGH? Or do you actively seek to know MORE? This may seem like an obvious one for the Old Soul. You all are quite interested in knowing more. But look at where you are looking to know more in your life and where you are NOT willing to know more. And by this we mean as an extension of the seeing, sometimes you decide to not know another person because you refuse to see the ugliness in that person. You do not seek to know more about a struggle in another’s life because you have chosen not to see more of that individual or event or state. So the more you make the active choice to know more than you know and to know there is always more to know even when you think you know it all or know better, which we know many of our students find themselves proudly or quietly assuming, there is always more to know. These 7 Choices that you make across the lifetime are part of what you do in Review, how you organize the Review of your lifetime to see how much can be extracted from it that evolves the Essence and builds upon the knowledge of your Entity and your Cadre. So understanding these 7 Choices is not just an abstract concept to consider. Look at those 7 Choices in any experience where you feel challenged, where you feel recoil, withdrawing, and see which one of these may need to have some attention toward the ACTIVE and MORE side of the equation. Do each of you relate to these and understand how they play out? Do they seem to you to be no-brainers? In looking at these they were probably familiar to you already in some way. We’ll take a few question because we know Troy is going to need some time to return to comfort in bringing us through for a longer period of time in this form. So we will open the floor to some question if you have any, before heading out. [Question] Could you make a little clearer distinction between the 6th Choice TO SEE more and the 7th, the Choice TO KNOW more? They are distinctly different. To help you understand the difference we will choose to replace the word SEE with EXPOSE. When you EXPOSE yourself more to input from life it does not necessarily mean that you want to know anything more about it. You may willingly or accidentally “expose” yourself to, say a condition of another person or a struggle of another person or a people, and as soon as you see it close down and not want to know more. Do you understand? When you see it, it’s an invitation to know more. Just seeing something is enough to help you acknowledge its existence but this has nothing to do with the work that is needed to be done to know more about it. You can SEE Troy channeling but to KNOW more about what this is all about takes a little more effort. But some will choose never to SEE this. You have chosen to SEE this, and so now you have seen it and now that is a part of the structure of your life that has some amount of meaning. And then you have the work of knowing more by asking us questions such as, “What the hell do you mean?” [Question] I have a question. And I’m almost afraid to ask, but the problem I have is that the more I see and know sometimes the more it hurts. And I hate to see and know things that hurt so bad. So how do you navigate around that? You do not. It hurts. It hurts because you care and that is Good Work. You can become incapacitated by that hurt. You can become debilitated. You can become paralyzed by that hurt, but it is up to you to make that a temporary condition. You must look to see what you can do. If you cannot do anything, then you must do the work of acknowledging your limits. But the avoidance of hurt is not the goal of this life. Hurt is an invitation-- we do not seek to be so poetic-- but it is an invitation to love and you cannot always do more than that. And when you try to avoid hurt or you close down to the pain, let yourself do so. But you can only learn how to navigate this and transform it by making the active choice to do so. By learning what needs to be done, what you can do if anything. And if you cannot do anything all you can do is offer the most comprehensive version of your capacity to love as possible. But yes, life sometimes is painful. We remember. [Question] You said that this is a structure for Reviewing the life to learn what to extract from it and that’s something that is done during Review. Is that something we can focus on during the life? Yes, that is part of why we are sharing it. Because you can start now. The more Review that is done within the life, the more Essence is involved in the life. What we’ve described to you, and this may derail Troy’s intention for tomorrow’s topic, but as you ACTIVELY make the choices that we described, you are zippering up, so to speak, the gap between you and Essence. So the more you actively make the choices that we described, the more you are bringing Essence into the life as a part of it. And when Essence is a part of an experience there is immediate Review, there is immediate upload, so to speak, to a bank of sorting, and the bank for the Entity. So, the more you are living as Essence, the more this occurs and when you are on the other side of this life, so to speak, Review is more of a rejoicing than a sorting. Did this make sense? [Question] Do each of the 7 Choices in some way directly or indirectly link up with one of the 7 Roles? There’s always a correlation, yes, in some way and we did offer these up in an order that could be in the sequence that we tend to talk about the Roles, from Server to King. That’s the last question. Then it appears that we will meet with you again tomorrow. Your tomorrow. And with that we will head out. Good evening to each of you.